Entrance hall leading to kitchen fully-equipped and right next to living / dining room with outdoor balcony (covered for all weathers!). Head upstairs to bedroom 1 with 1x super king 6 foot wide bed + bedroom 2 with 2x single 3foot wide beds. (Bedrooms are the same size - one faces east and the other faces west. Both contain bedside tables, dressing table+mirror, sliding mirrored wardrobes, quality Dunlopillo luxury pillows, hair-dryers, laundry bags, towels, etc.). Bathroom 1 - toilet, bath with shower, large mirrored wall + basin + shaver point. There is also a guest cloakroom with a 2nd toilet, basin and mirror + shaver point. For a good illustration of this layout - see the floor plan photo. Welcome to the very heart of London! Overlooking Soho + Covent Garden, this superior accommodation is ideal for singles, couples, families/groups, offers wonderful panoramic views of the capital, and is in walking distance of the main tourist attractions. Nearby is Leicester Square, Trafalgar Square, Piccadilly Circus, The British Museum, No 10 Downing Street, Big Ben & The Houses of Parliament, Buckingham Palace, St Paul's Cathedral, The Tower of London. Right outside your door are the main London shopping, restaurant and theatre districts plus cinemas, museums, art galleries, nightclubs, parks, 24- hour shops etc, and excellent transport links to anywhere you need to go. Unit comprises: kitchen, lounge/diner with balcony, 2 double bedrooms, bathroom+2 toilets (see full layout on floor plan pic). Where Exactly are you located: Centre Point! many advertisers on this site use the term 'Central London', yet for the unwary they are not! Some of them are at least an hour (some nearer two hours!) train ride into what is truly the centre of London. These apartments are beside the landmark Centre Point Tower at the top of Charing Cross Road. The Charing Cross stone outside the station is the point where all distances in UK are measured from, so you can say we are not exaggerating about the location. See the exact location and aerial photograph, or look up postal code WC2H 8LW on GOOGLE maps. How Noisy Are The Apartments: The apartment is in a semi high-rise which overlooks but is set back from the junctions of Oxford Street + Charing Cross Road, on the small St Giles High Street. All rooms have secondary glazing so noise is not a big issue (secondary is better than double glazing - it is a whole additional sliding panel). Clients who have viewed the apartment in person (banks, blue-chip companies, theatres always do this for longer stays) are often very surprised at how quiet this unit is for such a great, central location and we would not have had the client list above or the repeat business if this flat were too noisy. one example: for 6 years Deutschebank booked in graduates who need a quiet place to study and work hard on training modules - they would not do so if the unit was in any way unsuitable, or if feedback from the graduates was negative. N E W S ! : London Underground has rebuilt Tottenham Court Road Underground Station to relieve congestion, with a new ticket hall nearly 6 times bigger, step free access and improved interchange. The new Crossrail line starts running in 2019 providing 24 trains an hour, with tube journies from Heathrow direct to the apartment in 30 minutes - half the previous time! A new plaza is being created outside Centre Point with many al fresco restaurants now opening on the doorstep. Please be aware there is therefore construction work going on across the road (daytimes only) and whilst not unduly disruptive noise-wise to our building (we have secondary glazing in any case), the views from the flat may be temporarily less attractive as a result. Soaps, shampoo, conditioner, shower gel, bath foam and toilet rolls are included as a welcome pack. Towels, bathmats + hair-dryers are also supplied. 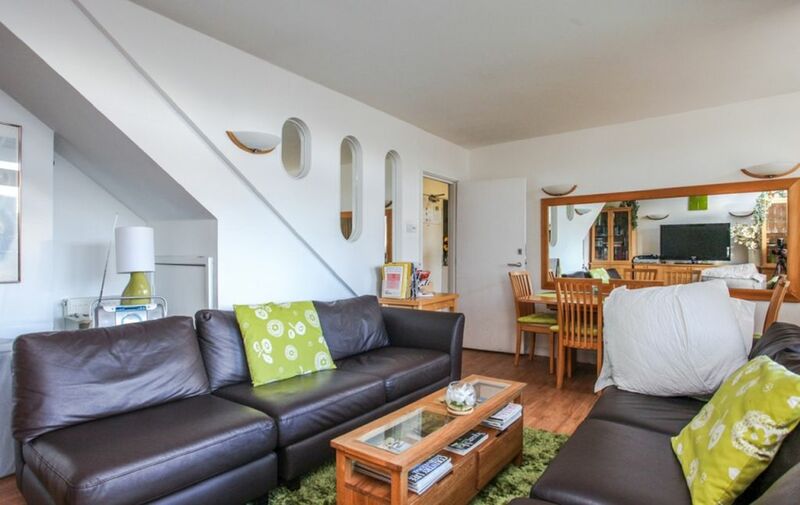 The owner of this serviced apartment prefers longer stays at the moment, so it is rarely available. The apartment is in a semi high-rise building on a small road called St Giles High Street, opposite the pretty St Giles in the Fields Church. This uniquely places the apartment at the direct meeting point of Soho, Covent Garden, Bloomsbury + Holborn - in an area also known as Centrepoint, the West End + Theatreland. The rooms overlook the intersection where the top of Charing Cross Road joins New Oxford Street, Tottenham Court Rd + Oxford Street (London's main shopping streets). There are views of East and West London in the distance, so you can get some terrific sunrises and sunsets! On the doorstep: Supermarkets (Sainsbury, Morrisons, Waitrose, M&S Simply Food, Tesco), Newsagents, Boots Pharmacy, Starbucks, Cafe Nero, Foyles bookshop, Carphone Warehouse, Argos, numerous Restaurants, Bars, Convenience Stores + Cafes. This is a fantastic location to be based! N E W S ! : London Underground is rebuilding Tottenham Court Road Underground Station to relieve congestion, with a ticket hall nearly 6 times the current size, step free access and improved interchange. A new Crossrail line is being constructed, with services starting in 2019 providing 24 trains an hour. A new plazza is being created outside Centre Point. It will be great when finished, as tube journies from Heathrow will run direct to the apartment in 30 minutes - half the time it takes now! Please be aware that there is therefore construction work going on across the road, however we have had long let rentals in the building renew tenancies for 12 months, so it is not putting off renters. There may be WORKS going on (daytimes only) below the flat as new Restaurants are opening..